Homespun Stitchworks..... For the love of vintage: Wonderful winter stitching time. Hello and good morning to you all. Well with the weather and all it's unpredictabilities at present, I am rather enjoying my design and stitching time. I love my sewing room and watching the rain bashing relentlessly at the window. I adore the sound of the rain and I know I am lucky to be inside in the warm and dry on days like these. Sometimes if I am waiting for a parcel I sit and sew in my kitchen and have my radio on in the very back ground. I know alot of you really do not like the Winter but I embrace it, infact I embrace all our seasons.... For me this time of year is a cosy time, and I really adore our open fires going. January/February months can be very bleak but in my book if you are cosy and can stitch, you are living like a Queen and if you have a good hearty stew cooking and a bottle of red wine waiting for later the King is happy too! 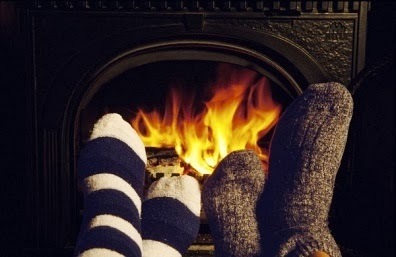 Winter is the time for comfort, for good food and warmth and the touch of a friendly hand and to talk beside the fire. It is the time for home.